Changes in load, shaft speed, oil flow, oil inlet temperature, or bearing surface finish can affect bearing surface temperatures. 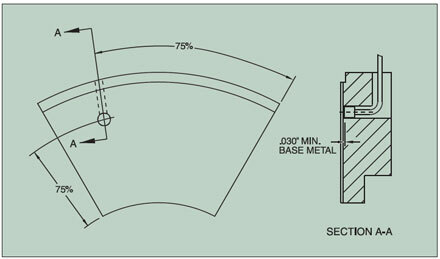 At excessively high temperatures, the shoe babbitt metal is subject to wiping, which causes bearing failure. Consequently, for critical applications, Kingsbury recommends using shoes with built-in temperature sensors so you can monitor actual metal temperatures under all operating conditions. Either thermocouples (TCs) or resistance temperature detectors (RTDs) can be installed in the shoe body near the shoe body/babbitt interface. See figure below for Kingsbury's recommended location. If your bearing is subject to critically high loads, continual thrust measurement will give you a vital indication of machine and bearing condition. To measure thrust, we can install a strain gauge load cell in one or more of the upper leveling plates or thrust shoe. This load cell is simply a steel column which is stressed in compression under load. Wire resistant strain gages mounted on the column register the strain. Since the strain is directly proportional to load, instrument readout can be calibrated to show thrust directly. 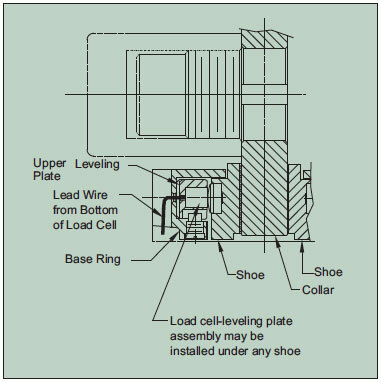 Each load cell is installed so that the bearing shoe rests directly on top of it, or if installed in the thrust shoe, the shoe support is replaced by the load cell and contacts the upper leveling plate. These arrangements allow thrust measurements within 2%, if all shoes are instrumented. However, we have found that you can obtain satisfactory accuracy for most thrust measurement requirements with one or two load cells per bearing. Note: Mechanical friction in the leveling plates precludes perfect load equalization. Load cells are individually calibrated in leveling plates or thrust shoes, numbered serially, and provided with calibration data. Load cell sensitivity and impedance are standardized to permit the consecutive reading of several load cells by one readout instrument. Standardization also permits connection of several load cells in series or parallel so that multiple load cells can be read with a single-channel readout instrument. Standardization is achieved by providing each load cell with compensating resistances soldered into a printed circuit board, furnished with an edge connector base. The printed circuit boards can be mounted in the junction box, or in the readout instrument if space permits. Metals used to make the load cell are stressed well below their 1010 cycle endurance limit, thereby assuring a life span equivalent to that of the bearing. Positive environmental sealing keeps load cell performance from deteriorating over time. Abrasion-resistant, Teflon® wrapped and fused cable permits permanent immersion in petroleum-based lubricants. Explosion-proof junction box construction is available. Analog readout instruments are standard, but other types are available upon request. Readout instruments can be equipped with two adjustable set points. 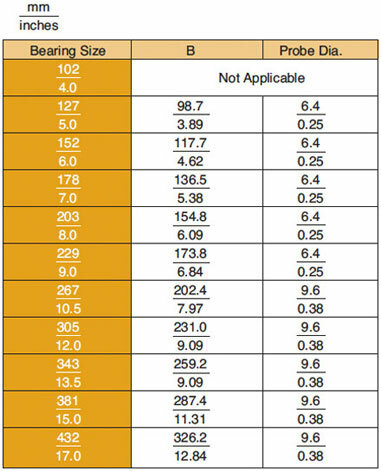 If knowing the exact axial position of your machine shaft is important, Kingsbury can incorporate a proximity measuring system into our standard equalizing thrust bearing. A proximity probe inserted through the housing, base ring, and lower leveling plates detects any thrust collar movement.